So we’ll be completely honest with you. You are going to get bitten at some point. But it’s not that bad! Hedgehogs have flat teeth similar to human teeth. Because hedgehogs are not rodents they do not have sharp gnawing teeth like hamsters, mice, rats, or rabbits. A hedgehog nip tends to be more of a pressure pinch than a puncture although, depending on where they latch, it is possible to break skin. If you’re turned off by the thought of this then please reconsider adding a hedgehog to your family. But we would say the same for any other animal. Even the friendliest of dogs and cats will bite when grumpy or provoked. Although we’ve yet to hear of a pet rock nibbling on anyone. This is usually, but not always, preceded by a few licks and a harmless nibble that some people incorrectly interpret as a cute kiss. Just like toddlers, hedgies explore with their mouths. 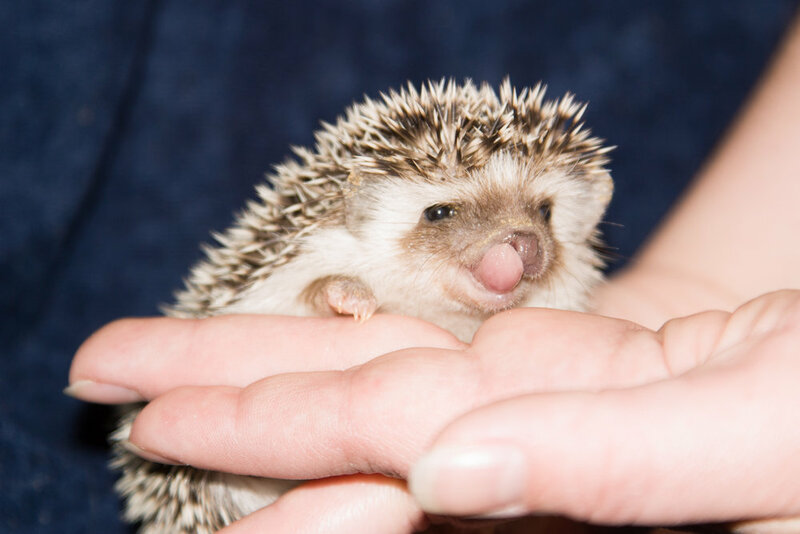 If your hand smells yummy because you just used lotion or handled food, or if your hand smells like something the hedgehog is frightened of, there’s a chance you’ll get a followup nip. Examples of smells a hedgehog may nibble at include grease, garlic, perfume, hairspray, and scented soaps, lotions, laundry detergent, and fabric softeners. Smokers and vapers need to be particularly aware that the hedgehog might be afraid of and chomp at the smell of cigarette, vapor, or marijuana residue on your fingers. Animals can’t talk. So they may use a nip, nibble, or bite as a form of communication. This is no different for hedgehogs! This could mean “I’m tired so put me back in my enclosure,” “quit holding me because I want to run,” “you woke me up and I’m upset,” or a million other things. It’s important not to start or reinforce bad habits! Hedgehogs are very good at remembering patterns. If you start a pattern where you immediately put your hedgehog back into its enclosure after it bites then you’re just reinforce that behavior! The hedgehog is going to start biting you to communicate when it’s tired or wants to go back to its enclosure. Instead, let the hedgehog run on the floor for a minute or two or cradle it in a bonding pouch or fleece blanket before you return it to its enclosure. That way it will disassociate its enclosure from nibbling. A warm hedgehog is a happy hedgehog that wants to be friendly and social. A chilly hedgehog falls into the “I’m unhappy about something” category and acts similar to a human with a cold — cranky, antisocial, and potentially aggressive. Warmth is critical to a hedgehog because, if they are chilly, they will attempt to go into a false hibernation. This can happen at any temperatures below 75°F. It’s for this reason why hedgehogs require a heating pad year-round. Even during the Summer! Please see our Supplies page for recommendations. Most hedgehogs don’t bite at all or don’t bite often. And generally, the more you socialize your companion, the less it’s inclined to communicate with its mouth. Here at Hamor Hollow our babies are handled and socialized on a daily basis once they reach ten days of age. So they are used to being held and enjoy it! If you continue to hold and play with your hedgie daily, your chances of getting bitten are slim. Most of the bites we’ve received over the years were either from pet store hedgehogs and rescues or when we forgot to wash something yummy off our fingers like pizza grease, but that’s not to say that your hedgie will never nibble. If a hedgehog does bite do not ever pull your hand away. Pulling away will encourage the hedgehog to latch or clamp down harder. Instead, either stay still, quickly push in towards the bite, or sharply blow a quick puff of air into their face. The hedgehog will not expect this and a startle will usually cause its mouth to open. A little preventive action goes a long way. Always wash your hands with unscented soap before playing with your hedgehog. To keep your hedgehog socialized, be sure to handle them often and keep them warm! That will make all the difference. It’s true you will get bitten at some point, but don’t be discouraged, because that’s just part of having any animal as a member of your family!